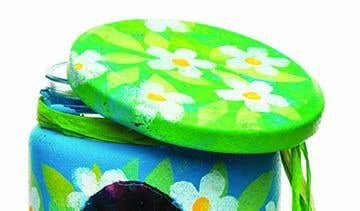 Simple homemade stencils are a quick and easy way to add Springtime patterns onto a painted jar. 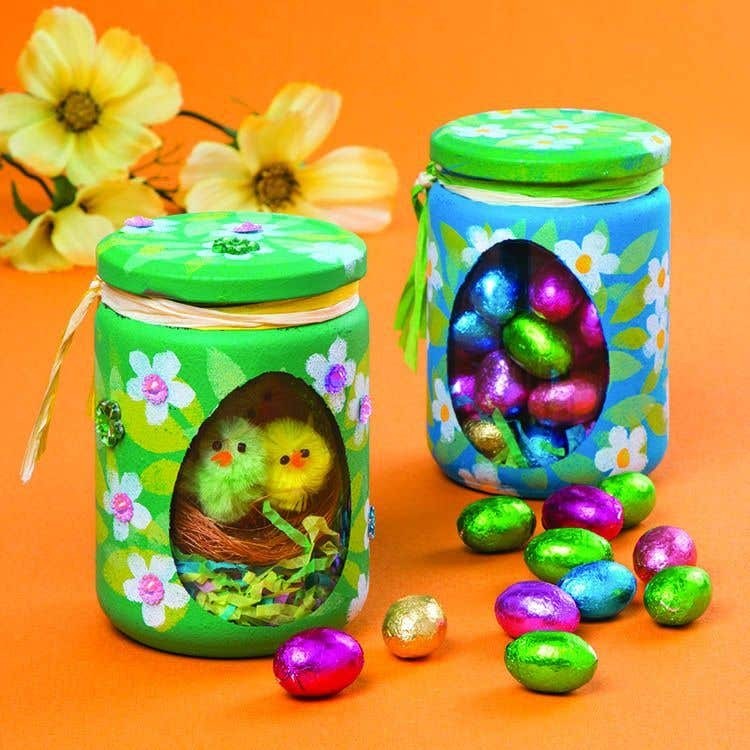 The jars can be filled with mini eggs or chicks as Easter gifts and decorations. Cut out an egg shape 7cm x 5.5cm from plain paper. To make it symmetrical, draw half an egg onto folded paper, cut it out then unfold. Lightly stick the egg onto the jar with small piece of double-sided tape. Dip a piece of sponge into paint then press it all over the jar and around the cut out egg. Leave to dry. Add another coat of paint so the jar is completely covered. Paint the jar lid using another colour and leave to dry. Draw a simple flower shape and leaf shape onto 2 pieces of 8cm x 8cm paper. Make the shapes approximately 3cm in size, leaving some blank space around the edge. Cut out the shapes with a craft knife to make stencils. Place the leaf stencil flat against the jar, holding it in position with a small strip of masking tape. Dip a small piece of sponge into paint then dab it through the cut out shape. Leave the cut out paper egg on jar while you do the stencilling. Carefully lift up the stencil shape, then re-position it and repeat more stencilled leaves around the jar and on the lid. Allow the paint to partially dry before lifting the stencil away from the jar and keep the paint fairly dry. If theres too much paint on the sponge, dab it onto some scrap paper before stencilling onto the jar. When the leaves have dried, stencil flowers onto the jar and lid, using a different coloured paint. Leave to dry. 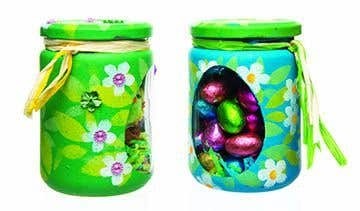 Peel off the paper egg shape to make a window in the jar. Tie raffia or ribbon around the neck of the jar. Glue acrylic gems in the middles of the flowers or add dots printed with a cotton bud. 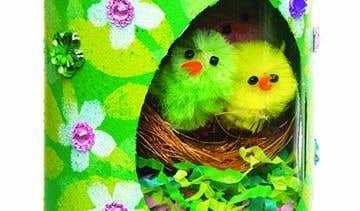 Fill the bottom of the jar with shredded Easter grass and add eggs inside or fluffy chicks in a mini nest. Use a pencil to adjust the position of the Easter grass and chicks inside the jar. The chicks can be glued together in the nest to help them stay in place.